MIAMI /PRNewswire-FirstCall/ — Carnival Corporation & plc’s (NYSE/LSE: CCL; NYSE: CUK) pier at Puerta Maya in Cozumel, Mexico — closed since being damaged by Hurricane Wilma in 2005 — will officially re-open when the 2,052-passenger Carnival Ecstasy and 2,056-passenger Carnival Fantasy visit the facility on Thursday, Oct. 16. Representing an investment of more than $50 million, the new two-berth pier has been specifically constructed to withstand a threshold category 5 hurricane and can accommodate any ship among Carnival Corporation & plc’s various cruise brands. In addition to the newly rebuilt pier, Puerta Maya’s nine-acre cruise center, which features a wide variety of shops and restaurants, will also re-open, along with a four-acre transportation hub capable of accommodating dozens of taxis and tour buses. Four rental car facilities will be available, as well. The Oct. 16 calls by the Carnival Fantasy and Carnival Ecstasy will be the first of 550 cruise-ship visits at Puerta Maya over the next year. In addition to calling at Puerta Maya, vessels from Carnival Corporation & plc brands will continue to utilize the other two piers in Cozumel. Collectively, these ships will bring an estimated 1.5 million visitors annually to Cozumel, who are expected to spend $126 million on the island each year. “Epitomizing the ‘fun in the sun’ landside experience that is so closely associated with Caribbean cruising, Cozumel is the region’s most visited cruise ship destination by far. Its gorgeous beaches, a variety of retail outlets and restaurants, and excellent watersports opportunities are enhanced only by the gracious hospitality of its residents,” said Giora Israel, Carnival’s vice president of strategic planning and port development. “The re-opening of Carnival’s pier at Puerta Maya will provide cruise ship guests with easy and convenient access to all the wonders of this fascinating destination, along with unique on-site shopping and dining experiences,” he added. Puerta Maya’s expansive cruise center houses 42 different outlets offering apparel, fine jewelry, artwork and other merchandise from such recognizable retailers as Goodmark Jewelers, Del Sol, Piranha Joe’s, Dufry, and Diamonds International. The facility also features 15 stand-alone carts where local merchants market colorful handmade crafts, costume jewelry and souvenirs. On-site dining options within the Puerta Maya complex include the Tres Amigos Bar, a new theme restaurant inspired by the 1986 hit movie starring Steve Martin, Chevy Chase and Martin Short. The waterfront eatery — the first of its kind in the Caribbean — offers traditional Mexican fare, along with an extensive beverage menu. Also featured is Pancho’s Backyard, a new franchise from the popular downtown Cozumel eatery featuring magnificent ocean views, as well as Fat Tuesday, a waterfront bar offering frozen drinks and light snacks, along with a DJ and dance floor. Other retail outlets at Puerta Maya include a pharmacy, convenience store, and international pay phones. There is also a newly constructed shore excursion pier, separate from the main pier, which allows for quick and convenient access to all water-bound excursions, as well as water-based transportation to and from the facility. The Puerta Maya pier and cruise center is located on the southwestern part of Cozumel, approximately five miles south of San Miguel, the island’s largest city. Carnival Corporation & plc is the largest cruise vacation group in the world, with a portfolio of cruise brands in North America, Europe and Australia, comprised of Carnival Cruise Lines, Holland America Line, Princess Cruises, The Yachts of Seabourn, AIDA Cruises, Costa Cruises, Cunard Line, Ibero Cruises, Ocean Village, P&O Cruises and P&O Cruises Australia. Together, these brands operate 88 ships totaling more than 167,000 lower berths with 18 new ships scheduled to be delivered between October 2008 and June 2012. Carnival Corporation & plc also operates Holland America Tours and Princess Tours, the leading tour companies in Alaska and the Canadian Yukon. Traded on both the New York and London Stock Exchanges, Carnival Corporation & plc is the only group in the world to be included in both the S&P 500 and the FTSE 100 indices. Additional information on Carnival Corporation & plc is available by visiting www.carnivalcorp.com or www.carnivalplc.com . BLOOMINGTON, Minn., /PRNewswire/ — Beginning last week guests at Mall of America began to experience the beauty and excitement of the Mexican Caribbean. Visitors can “Experience the Caribbean in Mexico” by immersing themselves in the rich culture as they are mesmerized by Xipe Totec, a dance group performing ancient Maya purification rituals. Indulge in authentic Mexican cuisine as Chef Federico Lopez, one of the 12 best chefs in Mexico, demonstrates how to bring the flavors of Mexico home. At “Experience the Caribbean in Mexico”, guests will be transported into what feels, looks and sounds like the beautiful region of Mexico known as Quintana Roo from Oct. 3 to Oct. 12. Guests will learn about the great heritage of the region through musical performances, physical activities such as rock climbing or using a golf simulator. And the event is not complete without giving kids a chance to participate in the great Mexican tradition of breaking a pinata. Families can also learn about turtle rescue efforts in Mexico and spend time with Dora and Diego in Nickelodeon Universe. For those enamored with Mexican cuisine, guests will have the opportunity to learn delicious Mexican recipes from Chef Lopez and Food Network’s Dave Lieberman. Lieberman will showcase his Mexican-inspired recipes and culminate with a signing of his new book, “Dave’s Dinners: A Fresh Approach to Home Cooked Meals.” With all of this to offer and more, the event promises to be an adventure to remember. The state of Quintana Roo is located in Mexico’s Yucatan Peninsula which stretches along the Caribbean Sea, and is home to four of Mexico’s most popular destinations: Cancun, the islands of Cozumel and Isla Mujeres, the Riviera Maya strip, and Grand Costa Maya. The event is presented by the Mexican Consulate in St. Paul, the Mexican Tourism Board, the state of Quintana Roo, MLT Vacations and Mall of America. For more detailed information please visit http://www.mallofamerica.com/. The Mexico Tourism Board (MTB) brings together the resources of federal and state governments, municipalities and private companies to promote Mexico’s tourism attractions and destinations internationally. Created in 1999, the MTB is Mexico’s tourism promotion agency, and its participants include members of both the private and public sectors. The MTB has offices throughout North America, Europe, Asia and Latin America. NWA WorldVacations(R) — one of the largest providers of vacation packages in the United States, offers an easy and affordable, one-stop vacation shopping experience, with convenient and flexible flight options from Minneapolis/St. Paul to the most popular vacation destinations in Mexico and an impressive selection of hotels, from small, secluded casitas by the sea to 5-star, all inclusive, mega resorts with every amenity imaginable. For more information, consult a travel agent or visit http://www.nwaworldvacations.com/. Mexico has a serious problem going on, folks. And although it hasn’t affected their dynamic tourist industry (except for a few border areas), the drug cartel wars are escalating rapidly. These guys don’t fool around. Tijuana has had 50 drug war homicides in the past week with two of the victims having been beheaded. Two more people were found outside a popular TJ restaurant stuffed into a barrel full of acid. More than 400 others have been killed in the border town this year, and most SoCal people are staying away from the popular coastline that leads from there to Ensenada. Mexico’s President Calderon has vowed to win this vicious war against the cartels, but the battle will be long and bloody and very possibly unsuccessful. Drug lords have many local police forces on their payroll throughout the country enabled by huge amounts of cash and weapons. And although most of the drugs are exported to the insatiable U.S. market, Mexico’s usage has increased as well. The number of drug addicts has grown by 51% to 307,000 since 2002, according to government sources. The real number is likely higher. Now Calderon has proposed a bill whereby small amounts of cocaine, marijuana and heroin would be decriminalized, providing the user agrees to complete medical treatment or a prevention program. Ex-president Fox had tried the same thing but withdrew his proposal under pressure from the U.S., who should probably be more concerned about our their own domestic laws than Mexico’s. I have stated before on this site that it’s time for the U.S. to legalize and control certain levels of street drugs. It’s the only effective way I can see to take the profit, the dealer’s lifeblood, out of the system. We having been waging this losing War on Drugs for 50 years and it’s way past time to try something different. Mexico has wisely taken a first small step in that direction. Washington, D.C., Oct. 3rd, 2008 – The Magic of Mexico website, a free and comprehensive training program for professionals in the travel industry, was awarded Travel Weekly’s 2008 Silver Magellan Award in the “Online Travel Services/Trip Planning” category. The program, developed by Destination Ventures, is offered to travel professionals by the Mexico Tourism Board (MTB). According to the Travel Weekly Magellan Awards committee, being selected a winner proves that one “represents a high standard of excellence within the travel industry” and this is certainly true of the Magic of Mexico program, as it offers a friendly interface, ease of navigation and educational content. This interactive learning resource contains a complete database of knowledge, resources, and sales insights, which will help in gaining confidence and experience, whether one is a Mexico expert or a beginner. The program will increase the knowledge of what Mexico offers, and therefore ultimately increase sales. Some useful tools included in the program are downloadable maps and videos, a blog, calendar of training events, and fam trips. It is essentially a one stop shop for all of the Mexico education needs. For those who wish to experience this education in person, Destination Ventures is also offering live seminars for Mazatlan, Riviera Maya, Los Cabos and Aeromexico airlines. These seminars are available throughout various cities in the United States and are a great way to network with other travel industry professionals. Going beyond the general courses, one can also take the following specialist programs: Mexico Hotels, Cancun Tourism Institute, Puerto Vallarta-PRO Specialist Program, Acapulco Academy or the new Mazatlan Mazters. Also, coming this fall is the Los Cabos Expert e-Learning Program. The September 29th issue of Travel Weekly will include a section entirely dedicated to all the Magellan Award winners, who will also receive trophies produced by the same people who make the Oscar® and Emmy® awards. For more information please visit www.magicofmexico.com or call 1-800-599-6633. Day of the Dead is a holiday celebrated throughout the Americas and combines ancient indigenous traditions and modern fanfare. It’s a whimsical and yet serious holiday that takes place between October 31st and November 2nd. Mexico may have the most spectacular festivals in the hemisphere. 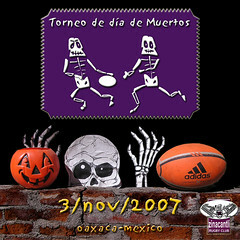 Well known are festivities in Oaxaca, Michoacán, and Mexico City. YOUR TURN – We are seeking photos of the holiday in the Day of the Dead Group hosted on Flickr. Photographers are asked to share their own photos. Registration on Flickr — http://www.flickr.com — is required. ORLANDO, Fla., Oct. 2 /PRNewswire-FirstCall/ — AirTran Airways, a subsidiary of AirTran Holdings, Inc. (NYSE:AAI) , today announced plans to expand its Caribbean services with new flights to Cancun, Mexico, effective February 25, 2009. The expanding low-fare carrier will offer roundtrip nonstop flights between Cancun International Airport and both Hartsfield-Jackson Atlanta International Airport and Baltimore/Washington International Thurgood Marshall Airport. Connections to Cancun will be available from throughout the AirTran Airways network. In addition to the nonstop flights, AirTran Airways will connect 55 destinations to Cancun through Atlanta, including Orlando, Fla.; Columbus, Ohio, and Philadelphia, PA. The airline connects to 7 destinations through Baltimore/Washington, including Boston, Milwaukee, and Burlington. AirTran Airways, a subsidiary of AirTran Holdings, Inc. (NYSE:AAI) , a Fortune 1000 company, is ranked number one in the 2008 Airline Quality Rating study. The airline offers coast-to-coast flights, North America’s newest all-Boeing fleet, friendly service and Business Class and complimentary XM Satellite Radio on every flight. To book a flight, visit http://www.airtran.com/. Only a few minutes away from Cancun, you can find what for a thousand years was considered one of the best kept secrets in the Mayan world: Rio Secreto, the Secret River. Rio Secreto opens doors into a fantastic voyage, offering a magical journey that brings alive the mystical tales from the Mayan underworld. Today its secrets are uncovered thanks to an amazing tour through an underground river where you can admire crystal clear water hollows framed by beautiful stalactite and stalagmite formations. This live natural museum is unique in the world. The adventure begins onboard a Unimog, an all land vehicle, which takes you on a 20 minute trip into the jungle to the Natural Reserve of Rio Secreto. Once there, you’ll be greeted by an expert guide who will provide you with special equipment to ensure safety and comfort so everybody enjoys this fantastic underground experience. The trip through Rio Secreto lasts about an hour and a half. In some areas, you’ll walk, while in others you’ll swim. During the trip, you’ll be able to experience and admire the unbelievable offerings of Mother Nature. You’ll discover these wonders at the rhythm of an amazing concert performed by water drops in a silent, quiet and peaceful atmosphere; undoubtedly, a unique moment to share with friends and family. At the end of the underground adventure you’ll be able to share impressions of your magical experience while enjoying a healthy lunch, or resting in the middle of the jungle lying in our traditional hammocks. Rio Secreto is much more than a tour, its part of a fundamental and responsible development plan in a privileged natural area where a protection agreement has been signed. This agreement promotes the use of clean and environmentally-friendly technologies and a culture of respect and conservation for the region’s natural resources. Our commitment is to preserve the beauty of our state and pass it on to future generations in better conditions than it was given to us.